Aged 21, my brother and his mates would be lounging around at home strumming away, flicking their hair and making music. And George Barnett and his band reminds me of those days. George is an emerging artist from The Midlands who sings, plays drums, piano, guitar, bass, trumpet and harmonica. He also writes, produces and records all of his own material – in fact he started making music aged 3. In short, he is quite astoundingly talented. This morning in Studio 1, Abbey Road Studios, George Barnett and The Ninth Wave played Lone Rose, Where the Devil Sleeps, 17 Days as well as Motion Picture Soundtrack by Radiohead. 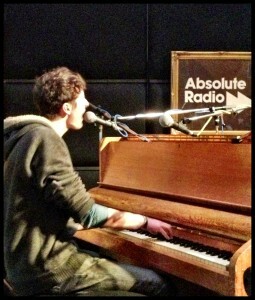 I was a guest of Absolute Radio at their Abbey Road Acoustic Session, championing new and emerging artists.